Robotics is one of the fastest growing segments of the technology and manufacturing sectors today. Over the last decade, collaborative robots, commonly called cobots, have emerged as a dominant technology on every manufacturer’s mind. With advances in safety, control, and other hardware technologies, robot manufacturers are able to deliver a product that is both cost effective and inherently safe to operate. Unlike their non-collaborative counterparts, cobots are simple and easy to program. 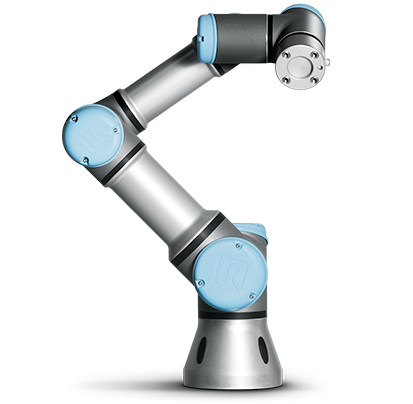 With minimal training, your workers can move your lightweight cobot from one location on your manufacturing floor to another and reprogram it for a new task in just a few hours. 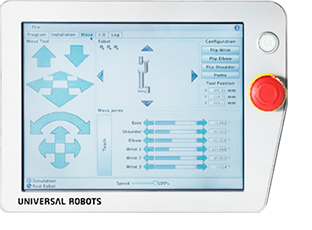 Some cobots can be redeployed in just a few minutes with Robot27’s custom user interfaces. Having the flexibility to move the cobot from place to place instead of tying it down to one working cell is one of the greatest advantages of cobotics. Cobots are robots designed to work right alongside their human operators. Integrated force sensors allow cobots to stop their motion if it comes into contact with a foreign object – whether it is a working surface, an obstacle in its path, or perhaps its operator. With the addition of sensors and other safety devices, the cobot’s operation can be slowed or stopped based on an object or person’s proximity to the work area. This key feature often eliminates the need for completely fenced-off work cells which take up valuable space on your manufacturing floor. 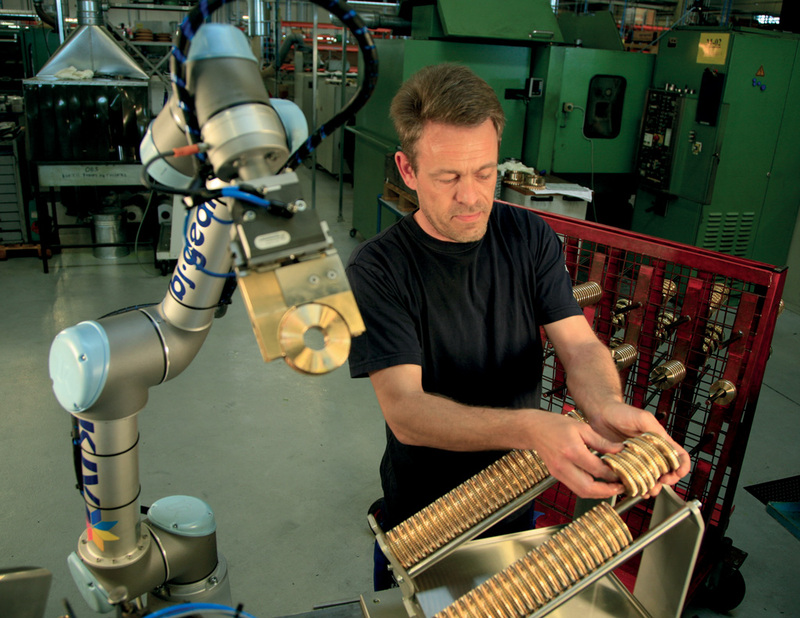 Cobots are often used to assist their operators for particularly repetitive or hazardous jobs. Programming a cobot to assist its operator by painting a part inside a paint booth, handling an awkward or sharp object, or performing a particularly repetitive task prone to precision errors helps increase your efficiency while also increasing workplace safety. It is important to stress that cobots do not replace workers. Instead, cobots augment your existing workforce by handling some tasks for your employees. This allows your valuable workers to perform more fine detail-oriented work or other tasks that are better suited for humans while improving workplace safety, precision, and repeatability. Cobots are robots designed to work right alongside their human operators. Watch this video from Universal Robots that demonstrates how a collaborative robot arm can automate virtually anything – from gluing and mounting to pick and place, and packaging. 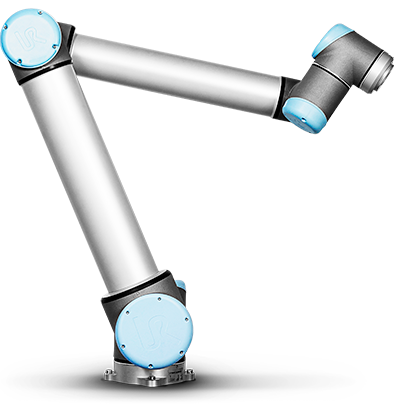 A robotic arm can streamline and optimise processes across your production operation. Robot27’s partner Universal Robots has sold over 30,000 collaborative robots to customers all over the world since 2009 in a market that is expected to grow exponentially over the next 5 years. Smart automation can allow your company to bring back parts or all of your production to the US. No more language barrier, time zone problems, production surprises, renegotiations, quality issues, long inspection trips. Bring production in house and under your direct control all while being price competitive with overseas production. Too good to be true? Watch this interesting video from the CBS Evening News. Everyone want jobs, but no one wants a dangerous, dirty job. Increase the quality of life for your employees while reducing your insurance risks and increasing your production flow. Reduce per-piece cost of production. UR Robots are much faster to test and deploy than traditional integrated robots. This allows us to implement in manageable stages rather than as one large project. First we do a schematic design of the entire proposed system. We identify the worst bottlenecks, and eliminate them first. Then we reanalyze the system to identify the new bottlenecks and eliminate them. The cycle repeats until further automation is no longer cost effective. UR arms can be implemented in virtually any industry, in any process, and by any employee. Around the world, more than 30,000 operating UR robots are a testimony to just that. Whether you are looking for a robotic solution for the sake of precision, speed, optimization or ergonomics, we can help you. And probably at a price that will surprise you. UR robots have an average payback time of just 195 days, which makes them the most favorable on the market, within the reach of most companies. But that is far from the reason why Universal Robots is the world’s Number 1 in collaborative robots. Since 2013, Google has been retooling its robotics program. The New York Times recently gained access to some of the new technology the tech conglomerate has been working on. Google’s researchers are currently focusing on machine learning – one of the hottest topics in collaborative robotics. The article notes that “machine learning – not extravagant new devices – will be the key to developing robotics for manufacturing, warehouse automation, transportation and many other tasks” in the coming years. At Google’s new lab, two UR5 cobots were being used in their application called TossingBot. The first was equipped with an OnRobot 2-finger electric gripper and was using an overhead camera system and machine learning environment programmed by Google to pick random objects consisting of ping-pong balls, plastic bananas, wood blocks, and other items out of a bin and tossing them several feet across the room into a plastic box held by the other UR5. According to the article, it took about 14 hours of trial and error for the cobot with the gripper to learn from scratch how to locate and throw each of the random items into the plastic bin with 85 percent accuracy. When the program was first started, the cobots did not know how to throw any of the items in the bin. For comparison, researchers laden with the same task had about 80 percent accuracy. This impressive marriage of physics, cobots, and a style of machine learning that google Google calls “deep learning” could shape the future for companies like Amazon and UPS. The Times notes that “humans sort through items that move in and out of distribution centers. A system like Google’s could automate at least part of the process…” which would certainly lead to faster order placement, faster product delivery, and lower costs for consumers.